Well, another crazy & busy week is all finished. This week's theme? Proud moments. 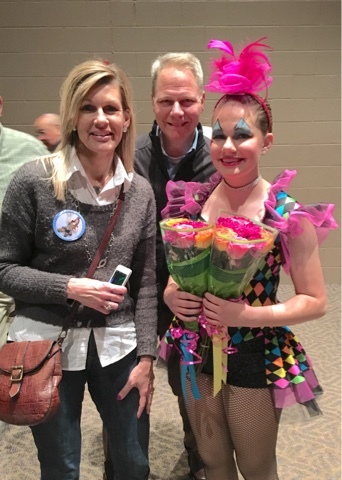 Monday started out with a half day at the office, an afternoon playing "catch-up" on the blog, and 75 minutes of stage rehearsals for the youngest daughter's dance recital. Oh, and there was that little #nevermissaMonday adventure when I returned home from the dance stuff. 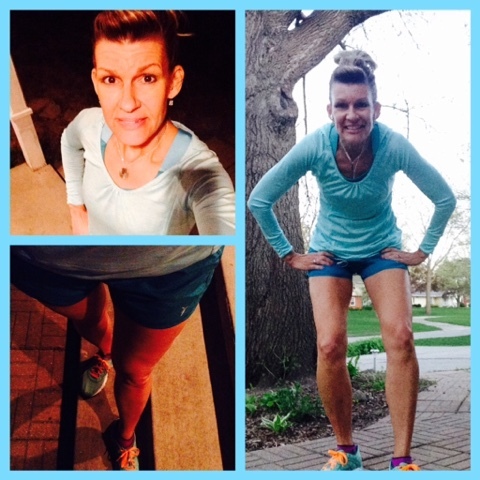 I met up with my friend, Barb, and we decided to run a "a few" miles. I typically run a simple mile (sometimes two) just to have some form of fitness/exercise on a day when I typically do not feel like doing so. I knew my week was going to be crazy, and my running opportunities limited, so Monday was a prime day to "get ahead" on the miles. Barb has gotten to be quite a bit faster than me, and sometimes she has a lot more energy to get it done quickly. 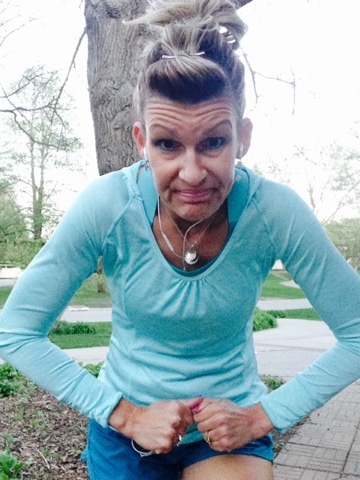 We ran about four miles at what felt like a fast tempo pace. I didn't have my watch, and her watch was having some attitude...but we guessed our pace to near (or under) a 9-minute pace. I'm proud that I could keep up with her! We just ran "by feel," and had limited conversation because it's kind of hard to talk in complete sentences when you're (darn near) hyperventilating. Also, we were chasing daylight....it was still bright outside when I left the house, but near dark when I returned home. And I slept like a baby that night. Wednesday was a day of icky weather, long hours at the office, and a 4:00PM start time for the dress rehearsal for recital. The daughter is now old enough to drive herself (and just took all her "dance gear" with her to school that morning, so all I had to do was meet her backstage with some snacks. Thursday was a day with decent spring temps, and I finished up at work shortly after noon, so I was able to stay home for the afternoon. The temps were cool (in the mid-50's), and were similar to what was in the forecast for my half marathon (on Sunday). I decided to go for a run and test out some race day clothing options. Guess what? Rain was in the forecast for the next several days. 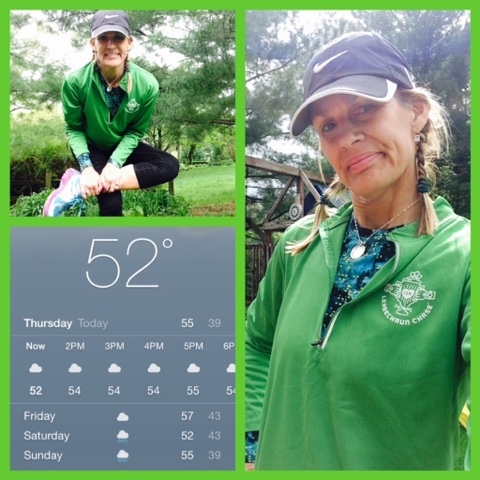 I have run several half marathons (26, not that I've ever counted), and I have run some of them in the rain. Those races in the rain, though, have all been in much warmer weather. Rain in 50-degree temps, I'm guessing, feels much different than rain in 70-degree temps. Ugh. I decided to wear a long-sleeved flannel lined top with a 1/4 zip jacket and capri's. Let's suffice it to say that I was kind of a hot, sweaty mess after 4-1/2 miles. So, that experiment showed me that I do not need two layers on my arms (and NO flannel-lined anything would be necessary). I'm proud I had the foresight to do this test run. As soon as I got home, I had a text from the daughter. She had another tennis meet (that we were planning to go to, out of town), but had learned she would (again) be playing sooner than later. Yikes. I called the husband home, did a quick wipe-down and changed clothes (but left the hat in place, to hide the hair). 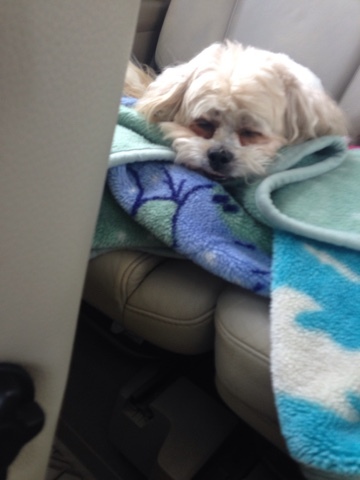 We were on the road within 20 minutes, and decided to take Max along. Dogs are not allowed at tennis meets, but it was cold enough that he could stay in the car for the 30 minutes or so of her match. She and her doubles partner won 6-2, just as the rain started (#proudtennismom). 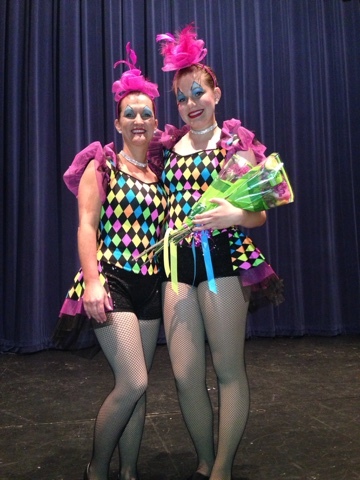 Friday night was the first night of the dance recital. I have mentioned a time or two (or several) that I am a very ungraceful gal. 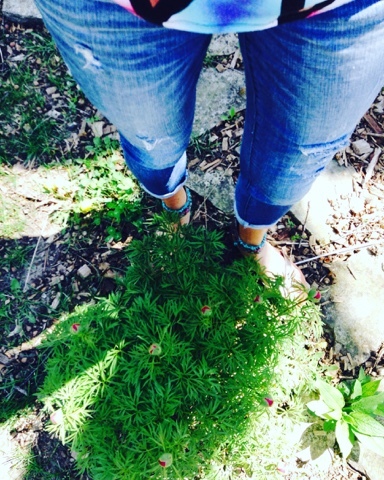 I can barely walk in a straight line without tripping over my own two (big) feet. That is not the case with our younger daughter. She was born with a natural talent for all things dance, and is pretty athletic as well. Every year, it makes me so proud to see her on stage. She can spin, twirl, leap and move like it just comes natural. Saturday was a "no-alarm" morning. After the busy week, I didn't feel guilty waking up without the hum of my radio. It was another rainy morning, so I wasn't missing out on anything anyways. 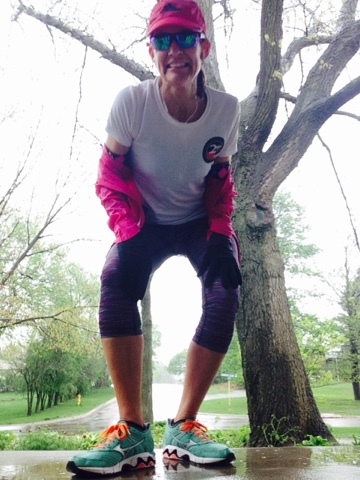 Then, about halfway through the morning, I got the bright idea to go for a run in the rain. Why? Because the temps, again, were almost identical to what the race day temps would be. I still wasn't sure of what to wear on race day...so I pulled on some capri's, a short-sleeved tech shirt, arm warmers, and my windbreaker jacket and headed out. The rain was light when I left the house, but gradually started coming down with more force by the time I returned back home. 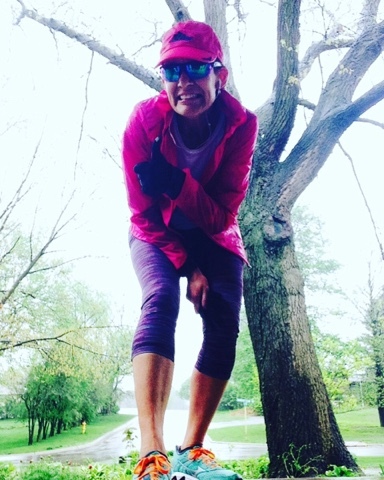 I only ran 2-1/2 easy-paced miles... but knew I'd chosen the right combination of layers. Success! Another proud "running revelation" moment. 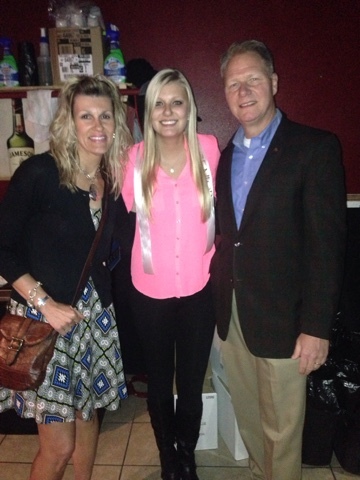 Our oldest daughter is graduating from college next weekend, so there was a party honoring her (and all the other seniors in her sorority) on Saturday night. Yes, I went to a party (at a bar) on the eve of a half marathon. And I may have had a drink or two, but also plenty of water to keep my hydration on the up & up. I had noticed the weather forecast had been gradually changing (for the better), and Sunday morning showed the same cool temps, but NO precipitation until late morning! Thank you, Momma N! I was out of bed at 5:00AM, and on the road by 6:15 to get to my race. 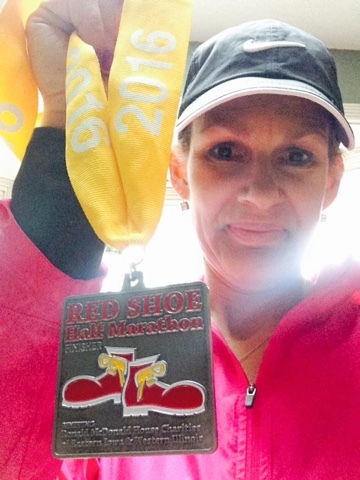 This was my first half marathon of 2016; it had been almost six months since my last one. This also was a new (to me) event, so I was a tad bit giddy with the excitement of running a new route. Spoiler alert! I'll just dangle a small carrot and share that the 13.1 miles went well, despite the constant hills...and I managed a sub-2 hour finish! The full race recap is in the works....(stay tuned). Spring continues to brighten my world. 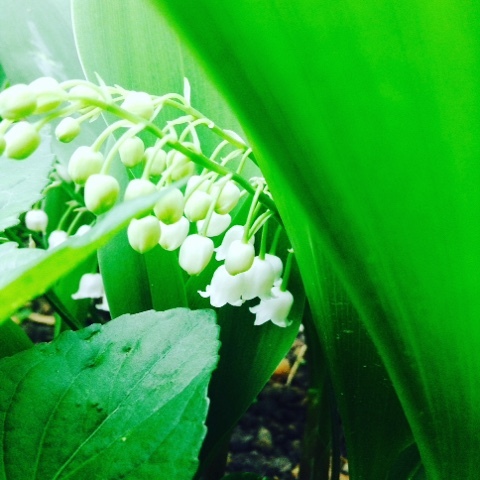 This week, the Lilies of the Valley started blooming. These little beauties smell so sweet! Also, my peonies are about to bloom! It seems like they're a couple weeks early. I love their intense color and wish they'd stay in bloom all summer! I haven't mentioned this, but I spent the month of April doing an arm/shoulder challenge. 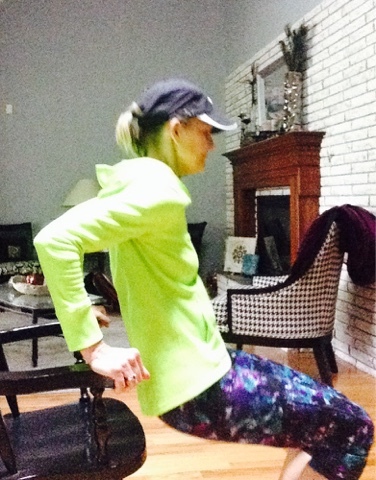 Every day, I did arm circles, push-ups, planks/downward-facing dogs, and tricep dips. That's right, EVERY day. This final week had me doing (daily) 25 push-ups, 25 planks-to-down dogs, 25 tricep dips, and four continuous minutes of arm circles (2 minutes each direction). And, lastly, is there anything more annoying than a too-long draw string? I've had these shorts for a couple years, and the stupid drawstring ALWAYS manages to peek out the bottom openings. Totally NOT a great fashion look. It finally occurred to me to just cut the dang drawstring out and be done with it. That was a another proud revelation. So, tell me about your week? Proud moments at a finish line? Busy family stuff EVERY night of the week? 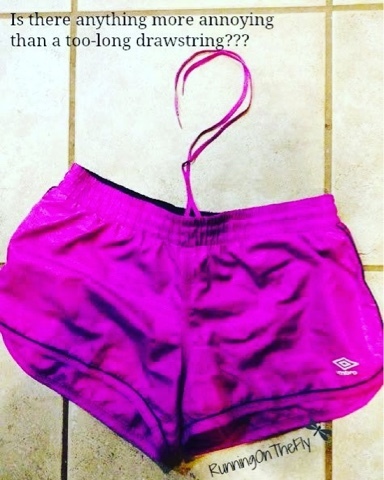 Have you ever yanked out a drawstring and bid it a fond farewell? As usual, I'm linking up with Holly from HoHo Runs and Tricia from MissSippiPiddlin for the Weekly Wrap. Do head over and checkout their blogs, as well as all the others. Ok, I'm totally envious of your sub 2! I can't wait to hear the play by play. Good idea on trying out the race day outfits! Holy cow with that challenge! Your arms will look smoking hot in your summer tanks. I've got a lot of craziness coming up with my graduate. I hope I can pull it all together. Thanks for linking with us Kim! Thanks, Holly! That sub-2 has been a long time coming! So many great moments! Congratulations on your college grad! Looking forward to reading the recap, sounds like it was a dream race. Thank you! The race certainly felt like a dream...one of those rare surreal events where everything just felt right and went well. Wow! Busy and definitely a week to be proud of on many counts! Congrats to your girls and I can't wait to hear more about your race! I've had a couple crazy busy weeks....not sure if I'll know how to act this week with only a couple tennis meets (and a small gathering for the daughter's graduation). Congrats on your sub 2 race, especially after going to a party the night before. Your photos with your daughters are lovely. Isn't it fun to see them go through such special things like college graduation and dance recitals. My daughter also danced and I loved those recitals so much. I love the entire dance experience...even though it gets a bit crazy in the final weeks prepping for recital. Thanks! It's certainly a unique medal! Wow, what a full week you had! Congrats to your daughters on all of their accomplishments, and congrats to you on that sub-2 half! You should be proud...of your kids and yourself. Sub-2!! Let me know your secret. Awesome week. Good for you! I hate running in the rain unless it's tropical! I agree...rain in tropical weather is manageable (and refreshing). Rain in cold weather is painful. Your daughters sure do keep you busy. You have every right to be proud! It's been raining here too off and on. I don't mind running in it if it's warm but you are right, 50 degree rain is not fun! Congrats on your sub-2 and congrats to your daughters! You have quite the accomplished family! And totally with you on the drawstrings! Congrats on your relay! That looked fun!! Congrats on your race! I'm happy that the weather stayed decent. I ran the LA Marathon in 40 degree rain once. So cold and miserable my running partner and I never took off our trash bags! We didn't even think to plan a trial run! Rain can be somewhat of a deal breaker. If it's a light sprinkle (on a hot summer day), it can feel nice. If it's a torrential downpour (on a cold day), it's miserable. What a busy and wonderful week you had! I'm also not a big fan of racing in rain when it's cool out. Rain can make or break the experience. One time I ran a 20K than had pouring rain for the first 15K or so of the race.....yuck. So many opportunities to be proud! Both personal as well as #proudmom. We all have to have #winning moments. Congrats on your race! My #proudmoment would be cooking real things for Alex to take to work (honestly, the ingredients were delivered to me and saved me the trip, lol) and going to the Flywheel class even though I wasn't all that with it. But it definitely showed me just how much I need to work on my leg turnover! Sounds like a great week!!! Congrats on your sub-2 again, that is SOOO awesome! What a great week for the whole family! You weren't kidding about proud moments- congrats! I love how test ran your race outfits! congrats on that super finish can't wait to hear more about it! Happy Monday! Another fabulous week for all of you! Can't wait to read all about your half! New races are always so exciting! I LOVE the excitement of a new race! Great photo diary from the week. Congrats to your daughter and too funny about that super long drawstring! AWW !! Yay for proud parents at dance rehearsals! Congratulations on the Half marathon! I am so with you on your story of running with Barb. I have a friend that is faster than me and it is exactly like that. She does all the talking I'm just nodding and yea this an yea that, because well I can not run this pace and talk so you just got to pick. You want to talk? Run slow, you want to run fast? You do all the talking, lol. Thanks Kim for linking up with us! Wow, you had a very crazy week. I am tired just reading everything you did. Go girl !